I can’t believe this day has arrived! I mean, I dreamed of it. But it’s really here now. Paleo bagels!!!! So much excitement around these little packages of joy. Having gone without grains for years, biting into a paleo bagel is somewhat of a highlight. These soft paleo bagels are slightly chewy. Just the way I like them. But they are also light and hearty at the same time. 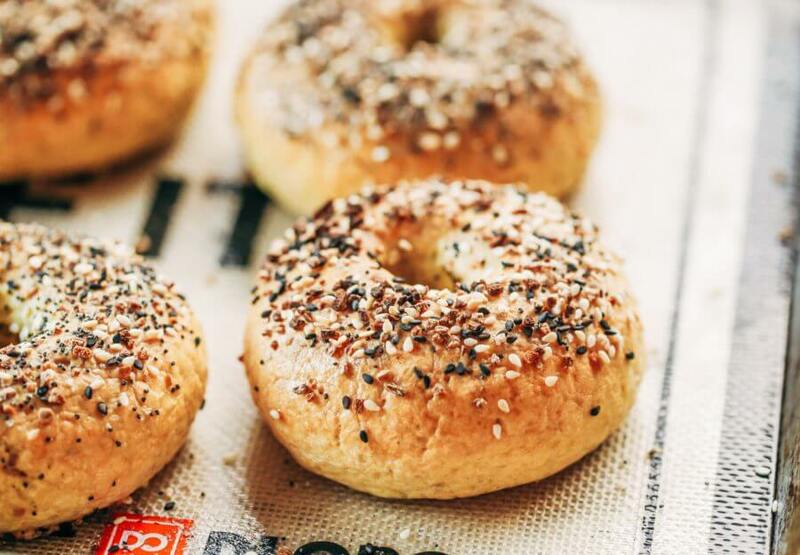 The light flavor of these bagels is mixed with a slight sweetness. I thought making bagels was going to be a huge endeavor. 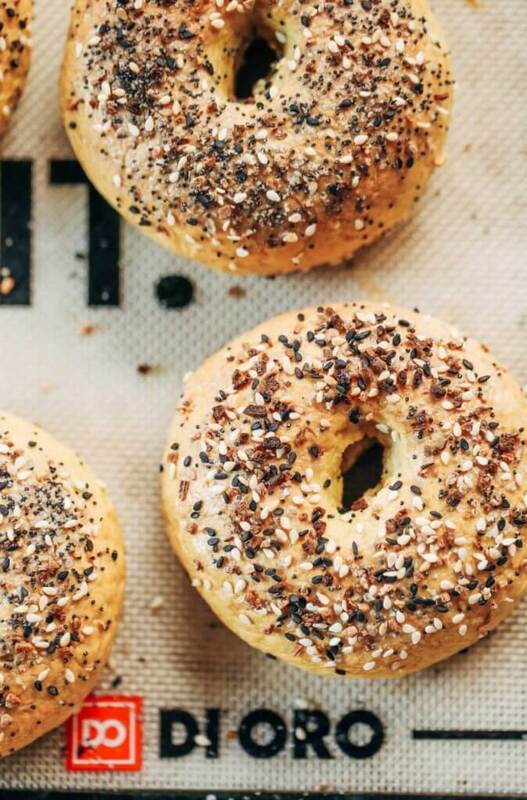 As it turns out, these bagels are really easy to make! I feel like l’ve been in a summery mood all week. Because, all I want to do is lay around at the lake or in the pool. Staying cool has been the first thing on my agenda. And then comes work. This is the beauty of making my own schedule:) I have been squeezing in a few hours of work in the morning before it gets to hot. As a result of taking a break in the afternoons, my evenings are set aside for more work. 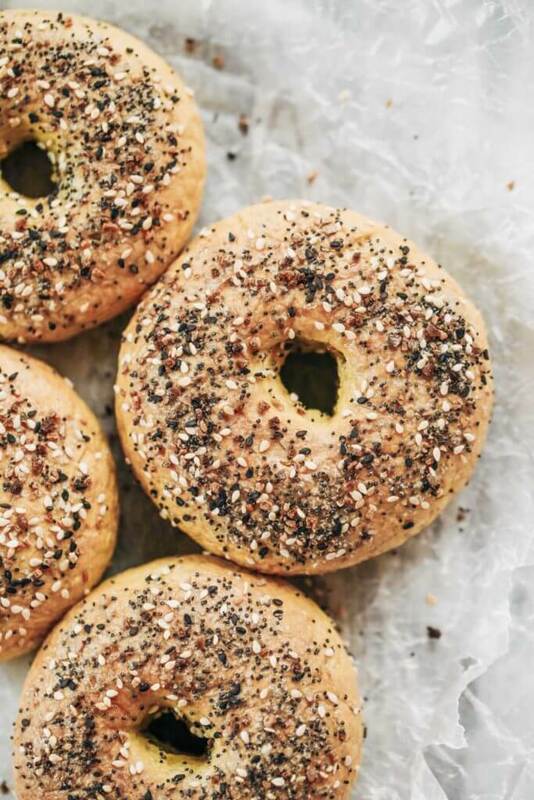 Because paleo people need bagels too, this recipe was a must. I’ve been itching to get this recipe up all week. I couldn’t wait to share these bagels. My brother was my assistant for this photoshoot. Everything seems to be more fun when I have my family helping me. It works out great, because He loves to eat. And of course, I love to cook. Cassava flour is made from the whole root of the cassava. The cassava root is peeled first, then dried before it is ground into flour. Therefore, cassava flour is a whole food still containing all it’s nutrients, enzymes, and fiber. Cassava flour is an easy to digest starch and paleo approved! Cassava flour cannot be substituted in this recipe for another type of four- find it here. 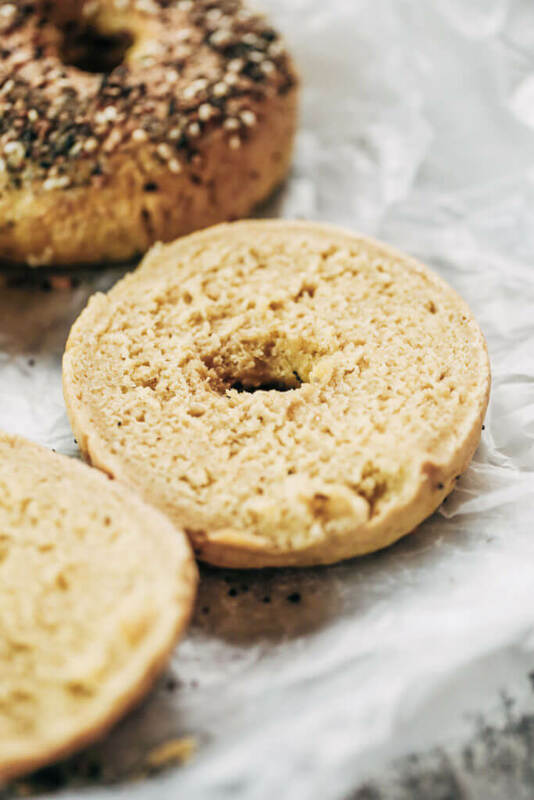 Gluten free, grain free, nut free, no yeast, easy, healthy, paleo bagel recipe. Best easy to make paleo bagels that taste "real"! You wont even know they don't have grains- because they taste and look like the real thing! In a KitchenAid mixer (or by hand), combine all of the ingredients for the dough until smooth. Separate the dough into 4 equal parts. Fill a large sauce pan with 2 quarts of water or half way full. Bring the water to a boil and then turn it slightly down, but keep the water boiling. Roll each segment of dough into a ball and then shape it into a bagel. You may have to wet your hands to shape the dough, so it doesn't stick to you. 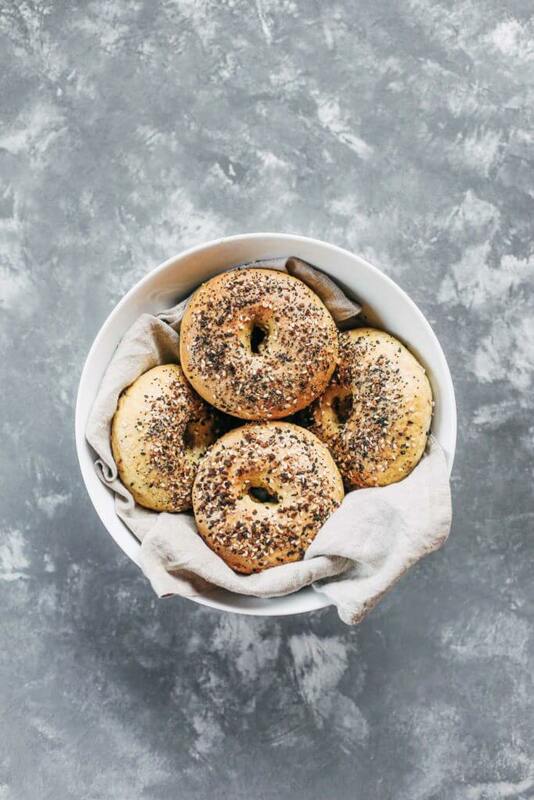 Drop one bagel at a time into the boiling water and let them cook for 1 minute on each side or until they rise to the top of the water. 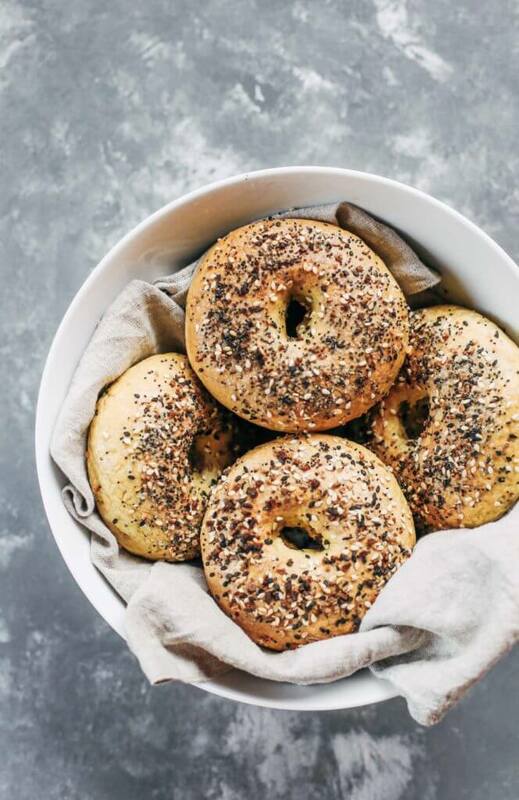 Once the bagels have boiled, set them on the baking tray. 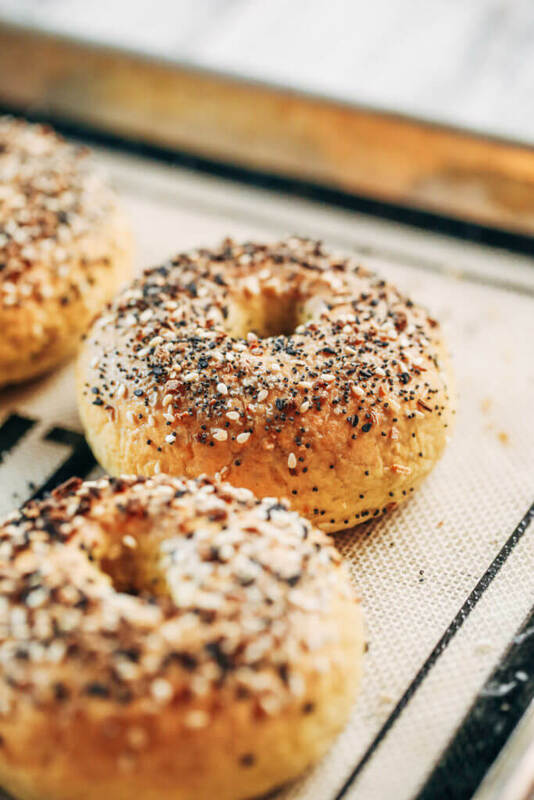 If you so desire to put an egg wash on the bagels to make them brown- simply brush the egg wash on top of the bagels and then sprinkle the sesame seeds over the tops of the bagels. Bake the bagels on 350 degrees for 25 minutes until golden brown. These are incredible! Thank you so much!!! Super easy flawless recipe that came out perfect! What a wonderful bagel they are almost exactly like what I remember a real bagel to be. 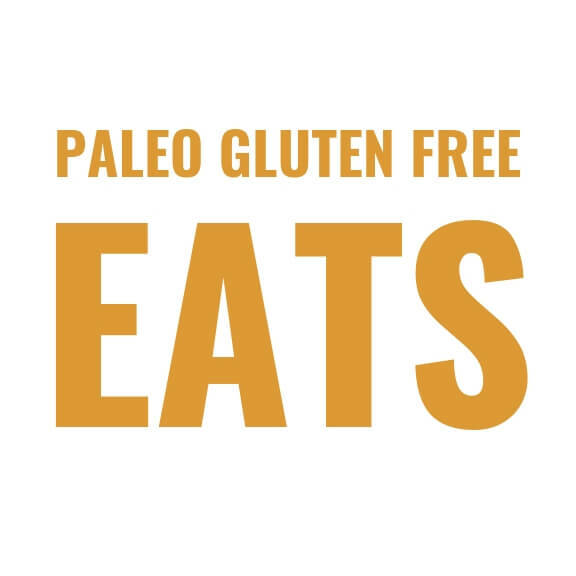 It’s hard with 3 kids to keep them paleo/gluten free this helps thanks!!! Oooh, so happy you enjoyed these friend:) They are one of my faves and I’m so happy that they were like you remembered! Have a beautiful day. Would these work with a gelatin egg? Hi Emma, I’m not sure about a gelatin egg… I haven’t tried it. Did you, or anyone, try them without eggs? Hi May, No, I haven’t. I don’t think it would work very well, but you could try. What should the texture of the dough be after combining and mixing all the ingredients? I did the 4 bagel serving size and the dough was very sticky and moist. The dough should be soft, but not so sticky that you cannot work with it. If you having trouble with it being to sticky, add more cassava flour to the dough and then wet your hands with water when working with the dough. Happy cooking! I am going to try this recipe. I tried to make bagels with cassava flour and tapioca starch modified from a wheat flour recipe and they came out very pasty inside. Other than some of the ingredients being different than your recipe, the steps were basically the same. They certainly don’t look like tours when cut open. Do you think it is because of the tapioca instead of arrowroot? Yes, arrowroot is very much so lighter than tapioca flour. I would not combine tapioca and cassava, because they are both heavy flours. I hope you enjoy! These were fabulous! The first time I made them I followed the recipe for two servings with egg wash but substituted butter for palm shortening ( I’m gluten sensitive but not paleo). I was thrilled with the true bagel texture but they were a bit too huge for me! I just made them again but made three bagels out of the ingredients for two bagels and whipped the egg whites separately before adding and subbed 1 tsp of Psylium husks for 1 tsp of the cassava flour in the hopes it might be a bit less dense. After cooking for 30 minutes I have three perfect bagels! My husband really likes them too and he is not GF. We made breakfast sandwiches- bacon, egg and cheese on sesame seed bagels. One of my pre-Gluten sensitive favorites! Thank you for taking the time to develop and post your great recipe. Ooooh, so glad you loved them!! Did you make 2 big ones the first time? The recipe calls for 4:) Ha ha, no wonder it seemed dense! What a great idea with the Psylium husk- thanks for sharing! Breakfast bagels are the best!! 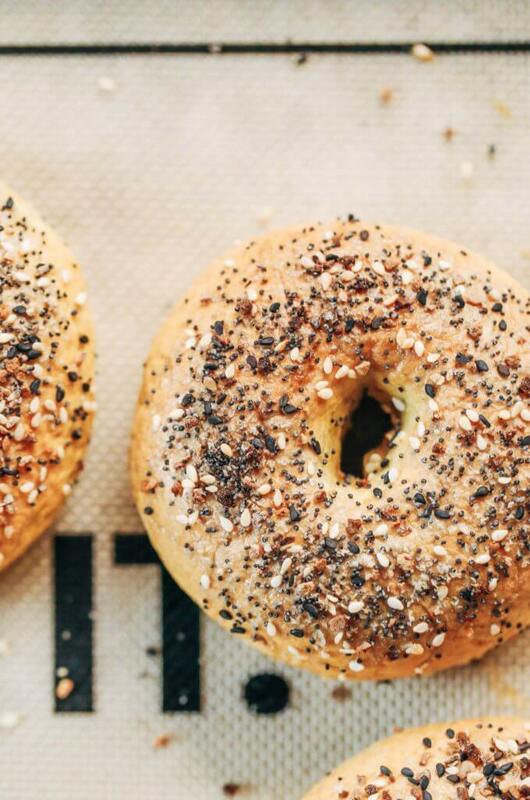 I cannot wait to try these (I’ve been craving bagels so bad lately)! Quick question about the cassava flour: do you weigh it out or do you scoop/level? What’s the best method to get an accurate cup measurement (I know that cassava is a little heavier than wheat flour)? Hi Kendra, I use just a measuring cup when measuring cassava flour. Hope you enjoy! Hi there. Instead of cassava flour can white rice flour be used.? HI Juliann, I am not sure… I haven’t tried it myself, so I cannot say. But I think it would work! How well doe these toast in a toaster and do they freeze well and then just toast without thawing? They toast in the toaster great- I haven’t frozen them before, but I would think they would be fine. Is there a substitute for palm oil shortening? I’ve been thinking about this one. I can’t have butter or coconut, allergies ugh! Anyway, I’m going to try these with ghee. I’ll let you know how they come out. But, I have an actual bagel pan, do you think if I just put them in the pan instead of a baking sheet with parchment they would turn out ok? I’m not sure when I’ll get to make them as I’ve got a busy weekend this weekend, but I will try to get them done and post my results. I followed the recipe exactly and when I cut the bagel open it was pretty pasty and wet. Do you use 4 large eggs or 4 medium? I noticed you say 4 medium eggs in your other bagel recipe. I used 3 large eggs but had to add a bit more water because the dough was dry crumbles. These came out great! So excited! How should I store them? These are FREAKIN incredible! Just made and they are delicious! Thank you for posting the recipe! Sharon, SO happy you loved them! Thank you! I made two batches of these today. I was a little hesitant because I have made paleo bagels before but they were dense and didn’t have quite the right texture. These are spot on , the texture is amazing ! I cannot believe how easy these were to make and how good they turned out. Thank you for this wonderful recipe! Oh Yay!! Loved reading this <3 Thank you girl! So happy you loved them. This recipe has saved breakfast! It can be incredibly difficult to figure out Paleo breakfasts, that can be made ahead of time, and isn’t sweet. First time making bagels AND using casava flour. They taste like a whole wheat bagel to me! I’m going to try and make a cinnamon raisin variety. I’m having just a minor problem with the arrowroot flour turning some areas on the outside, the middle, and the underside gummy and slightly translucent looking. Baking longer doesnt solve it. Perhaps I boiled it too long? I let the bagels boil longer than 1 minute per side because the started floating very quickly. Didn’t even get a chance to flip them in the bath. Thoughts? Is just how they are with the arrowroot? Hi Glory, hmmm. It’s weird how some of them are turning out and some are mushy… that’s so weird, because every time I make them they turn out perfect. Thanks for sharing! Glad you had success! Is the maple syrup necessary, or can I swap for something else? Hi! 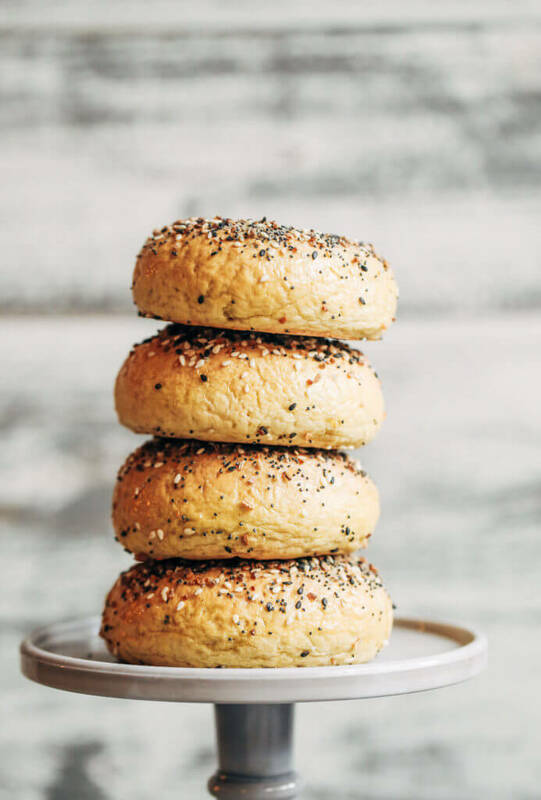 I am super excited to make these bagels, I got my cassava flour in the mail today! Question, can I substitute the shortening for something else? Palm shortening is really hard to find here, and I don’t really want to use regular shortening. Any suggestions would be appreciated, thanks!! I made these, and my husband and I absolutely LOVED them! This is such a great recipe! We were so impressed with the texture and flavor. Oooh, yay! That’s what I love to hear 🙂 Glad you enjoyed them Nikki. Loved the taste of these they were incredible! However mine came out very flat and dense…what did I do wrong? Overboil? Hmmmm, I’m not sure- I’ve never had that happen to anyone before. What size eggs did you use? These are awesome! We are loving having bagels again. It’s also fun to make them! Can I use a different substitute for the palm oil shortening? I cannot WAIT to try making these!! I grew up in NY, working in a bagel deli, and haven’t had an adequate “bagel” since finding I am gluten sensitive and then going paleo. Thank you!! I’m vegan. Any suggestions on substituting the eggs? Thanks! I see your recipes come up on my Pinterest feed all the time! Little did I know you live in Bellingham! I do too! So fun, and your recipes are amazing. They look so delicious, I can’t wait to try them. Hi Janet. Cassava flour and tapioca are from the same plant, but they are processed differently, so the result when cooking is far different. Tapioca is more of a starch like corn starch and cassava flour is more dry and reacts more like regular flour. I just tried these and am very happy with the results. I didn’t have cassava flour so used tigernut instead. It worked well except I had to add a little more and put in some xanthan gum to stiffen the dough a bit. But the taste was wonderful–very happy. I had seen an idea on facebook–some restaurant specialized in a car tire sized bagel, cut in half and topped with scrambled eggs, hashbrowns, ham slices, bacon and cheese, then the other half on top. Oh my, I’m glad I found a healthy solution to that obsession! I want to do paleo but I also want low carb. The carb count on these is huge. Is there another way to make these? Almond flour perhaps? How do these only have 2 grams of protein per bagel if there are 4 eggs in the dough? Home Run! I wish I could post a photo here. I also make cinnamon/raisin bagels based on this recipe. Nice job and thank you, Kaylie! Cinnamon-raisin sounds great! Could you post the changes you make to the recipe for this variation? I have to admit, I was skeptical about these, as I find cassava recipes to be hit or miss, but they came out great! I just ate one with paleo mayo and smoked salmon. What a treat to be able to have bagels and lox again! I followed the ingredients and directions exactly, with the only exception being that I left out the Tbs of water, since the dough looked like a good consistency without it. Once out of the oven, I let them cool on a wire rack for 15 minutes before I sliced them in half, and they cut nicely and were cooked to perfection on the inside. Thanks for a wonderful recipe! I made these yesterday. Used the comment for using yeast (bloomed in the water and real maple syrup). I let then sit for sbout a half hour then proceeded with your recipe. A couple of my eggs were on the x- large size so I best then and removed 1 T used for the eh wash. Trader Joe’s has Everything Bagel topping! I think I may have needed to bake just a bit longer, a we bit to moist, toasting took care of that. Interesting fact… cassava outs a resistant starch. Putt probiotics gut bugs digest these carbs so they get the calories and not us so win win. Hi Lindsey! They are best the first day! Storing them on the counter, because they have cassava flour means they will dry out really fast, so I don’t recommend it. They are freezer friendly though. These are really good! I realized I was out of arrowroot (boooo!) so subbed half tapioca half potato starch and that seems to work. I’m going to try again with arrowroot to stay true to the recipe. Thanks so much for this! Can I substitute the flours for almond flour or a cheaper paleo flour? Thank you! am i allowed to use almond flour and arrowroot flour. also can i use coconut oil or even butter instead of palm. I want to make this for my family but i don’t have most of this stuff and i don’t want to buy things for one time use. Hi Lisa, that would really change up the recipe and I don’t know that it would work unless I tried it myself. You can experiment, but I don’t know how it will turn out… Wish I could be of more help. Best of luck! I will have to try that out in the future! Hi! I made these and ended up having to cook them for about 15 minutes extra because they were still soft any gummy. Any ideas about why? Does this mean I didn’t boil them long enough? (They did rise to the top while boiling!) Thanks! Hi Shannon, it’s probably because of the brand of cassava flour- I have noticed people have had different results based off of what brand cassava flour is used. These were amazing! I did a few without the bagel holes in it because I was lazy. I thought they would be great buns slightly modified and even making a loaf of bread out of it. Have played around with the variations of breads? Thank you for sharing this awesome recipe! So happy to eat a bagel again. For everyone who is asking for a palm oil substitute, I used a little more than a 1/4 cup of olive oil and they came out great. Thank you so much for this recipe!! Can I sub palm oil shortening for any thing else? Coconut butter maybe? I really don’t like the cassava flour taste. It makes me gag. Is there another flour I can replace it with? Hi Cindy, I don’t really think another flour would work in exchange for cassava, sorry! Anyway of making these without the eggs?! Hi. I can’t stop making your bagels! So good. Next time I am going to try with yeast, just for the heck of it. However your recipe is so good, you don’t have to change anything. My grandkids are waiting for the mini bagels, that’s next. Is it 63 grams of carbs for all four of the bagels?? Hi Anna, it’s per bagel. I just made the bagels and love them! Would this recipe work if I added blueberries to the dough and made blueberry bagels!? Tried these twice and followed the recipe. Both times the dough came out almost like a batter. When I cooked the they are still not right. What am I doing wrong? I’m sure it’s because you used a different brand of flour- which one did you use? I use Anthony’s brand. Followed the directions exactly and was left with a gloopy sticky unusable mess. Hi Jo, I am sorry to hear that. Can I ask what brand of cassava flour you used? I have only tried these bagels with Anthony’s Goods (not sponsored, it’s just what I use) and it works perfect every time. Some people have reported using different brands changes the recipe, maybe this is what happened? Hi Kaylie! I tried this recipe and my bagels came out very dense!! I did boil both sides 1 minute per side…maybe that was too long? Is Nutiva’s Red Palm Oil the same as palm shortening? Yes! 🙂 That’s what I use sometimes. These look amazing! I’m so going to try tomorrow. Quick question, and apologies if it’s already been answered… the nutrition facts, are those for all 4 or are they the amount per bagel? Thanks again! I just tried this recipe and followed the directions to the letter- but the dough was so thin! Basically pancake batter consistency. I had to almost double the flour to get it into something I could turn into a bagel shape. Even then they were pretty floppy and would not have survived a boil. What am I doing wrong? The eggs were pretty large but that shouldn’t affect it that much. I also subbed Lard for shortening bc I couldn’t find any in the store, but again I wouldn’t imagine it would make that big a difference. Does the brand of cassava flour make that huge of a difference? Are there any other major factors to consider? I have used Otto’s Cassava flour with great results in the USA. I know in New Zealand they sometimes sell something labelled Cassava/tapioca flour. I have yet to make these in NZ. Maybe they are selling “cassava” that is really tapioca starch? I think I’ll start with a small batch for my first try at these down under! Hi. Thank you for the recipe! I substituted tapioca flour for the arrowroot. Whole foods did not carry the arrow root. I used 1/2 cup tapioca instead of the whole cup arrow root. I also substituted gluten free egg replacer for the eggs. I had to add more water than suggested. When they baked for 25 min they were still raw in the middle. I put in for another 10 min. But they were very dense and flat. Wow! I just made this and me and my kids are going crazy over how good this is! It was last minute and I didn’t have the oil, so I used butter instead. I also only had 1 tbsp of maple syrup left, go figure, so I used liquid stevia for the other tablespoon. I was worried it wouldn’t be good but I was so wrong. This bagel is amazing! I’m going to be searching your blog now for paleo bread. I’m really confused by everyone’s success with this recipe. I’ve tried making it twice now and all I have for batter is a watery mess. No actual dough. 4 eggs? That seems off? Hi Marie, what brand cassava flour did you use? Hi Marie, sorry to hear that- what brand cassava flour did you use? Just wanted to clarify about boiling one minute per side…when I flipped each bagel after one minute, it rose to the top and floated right away. Should I still be leaving it in the boiling water for that second minute? Thanks! Wow! Thank you so much Colette! That is so kind of you to share! Yes, that may very well be… the brand of cassava flour can really alter the recipe unfortunately. I use Anthony’s brand. Enjoy and happy baking! 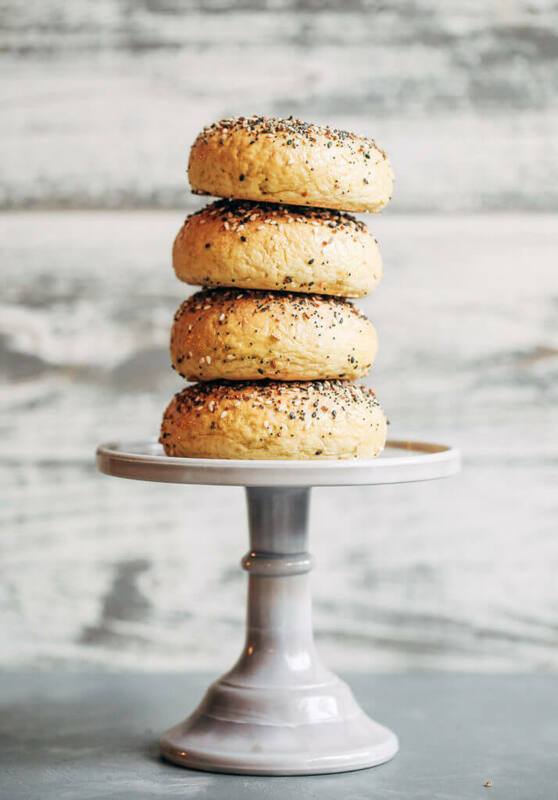 Love the idea of gluten free and grain free bagels! It was a big loss for me when I started to become sick from gluten and grains. I’m going to make pagels this weekend, but what baking powder do you use? Because the first ingredient is cornstarch in most. Is there a brand you use that doesn’t include cornstarch making the recipe truly grain free? Hi Stephanie, I use Clabber Girl non-aluminum baking powder… I’m not sure if it has cornstarch though.